The Path of Trust, Part 2, What is A Guru? « The Path of Trust, Part 1: What is It? The flood of comments keeps coming in from recent blogs about calling hallowed saints psychos and describing a path of trust that is perhaps higher and truer a path than those of borrowed faiths. So, let’s fill up a new blog page full of community commentary as we explore part two of the Path of Trust with something I wrote for a book published in 1999 (for more information, click on Messiah). The word Guru is a new victim in the serial killing of beautiful words by pop-culture. Apply it in titles like “guru of golf,” or the “gurus of Washington wonk” and you have secularized this Hindu term for a religious teacher to fit any Svengali of politics, sports or the arts. The technically correct dictionary translation of the Sanskrit word “guru” is the “venerable one” or “the spiritual master,” but that definition is a dead statue to anyone who has known and loved the real living and breathing article. The seeker touched by the presence of the guru knows a far more poetic definition. A guru is like a great cloud, heavy with rains. So burdened is the rain cloud that it cannot contain itself. The heavy cloud must give the rain to the earth. The guru cloud doesn’t put conditions on where it deposits its rains; the guru cloud will equally share its bountiful showers on the sterile rocks and the fertile, thirsty soil. A guru is a giving phenomenon. A guru drowns its parched recipient with a monsoon of love, a cloudburst of refreshing awareness. A guru doesn’t do anything. Just as the cloud doesn’t decide when or upon whom it releases its showers, a guru releases the heavy, bountiful silence and peace of his presence on everyone. And as with the rain, most people will just “open their umbrellas” and ignore this intrusion, while a precious few find the “soaking” inspiring. In this latter group are the people who seek out gurus. They gather around the guru’s tranquil eye in the center of a cyclone that is an ashram — the guru’s spiritual community, or college campus of seekers and disciples. Dozens or tens of thousands of disciples can surround the guru of an ashram, and it can appear to outsiders and followers alike that he is their leader. It can appear that he is doing something to influence them. But a guru is not a doer. You could say he is filled to the brim with being. The rain cloud doesn’t make an effort to grow flowers. Let the flowers and the rocks respond as they like. They are the doers. The rock does the drying off and forgets the rain; the seeded earth does the blossoming. A guru is a catalytic agent. He or she precipitates a process in disciples without being involved in or changed by the consequences. He may walk and sit and eat and do the things other people do. He may help precipitate a transformation in his disciples as a result of committing some action that might surprise and shock the disciple to attention. A guru can be like a thunderclap—a rain cloud thunders whether or not anyone is there to be jolted to attention. The doing — or lack of response—to the Guru’s thunder is up to the disciple. Each seeker of a spiritual teacher must bear witness to this mystery in their own unique way. I can say from my own experience that you know you are in the presence of an authentic guru when just his presence, his silence, is enough to bring new context to your existence. Just the fragrance of the master’s “Is-ness” can resurrect a forgotten knowing. Just his aura of no-worry, no-body-ness can nourish new buds of a lost innocence sprouting in a life lived in the drought-cracked land of society’s conditioning. The guru is full of an emptiness you once had: a cleanness of mind and spirit you had forgotten. 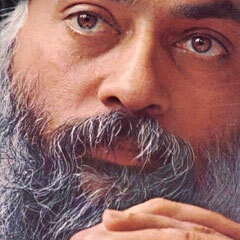 The guru is a catalytic agent for remembrance of a time when your brain wasn’t a dustbin for other people’s ideas and emotional baggage. The master’s call is like the first kiss of humidity against the cracked and desiccated land. It is the electricity in the dry season’s stifling heat preceding the guru thunderstorm. You are expectant like the land. You trust that wet kiss on your cracked and desert-like face more than all the so-called better judgment dumped into you by your society’s mentors and tormentors. Something magnetic awakens inside and it draws you to his presence. Your heart leads the way, dragging the ego along like a cluster of cans clattering behind a honeymoon carriage. You go to the guru dragging your rusty bits of better judgment, ideas of love, and mental training along for the ride. You go to your master. You take a risk. Maybe society is right, and your guru is indeed a madman like a Hitler, or Jim Jones, or an Ashahara. Still you gamble that this one will not exploit you for his or her own messianic ego trip. You put your trust in your guru as being God’s madman, or as Godliness itself wearing a persona or masquerading in a brief illusion of form as a fly lure for the Infinite Fisherman to catch your heart. Once it becomes clear that you have, for better or worse, already thrown your “deity dice” on this person’s crap table, you become your master’s disciple — you become someone willing to learn. This is fifty percent of the journey down the path of trust. In the second half the guru helps you take two more steps on the path. for the Second Coming , p. 218-219. We will explore those two steps in Part Three an Four. 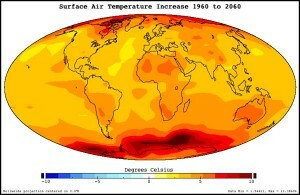 Surface to air temperature increase from 1960 to 2060. 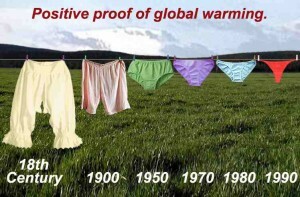 Read more about he cause of the temperature tsunami in Predictions for 2010 and how it can be moderated. 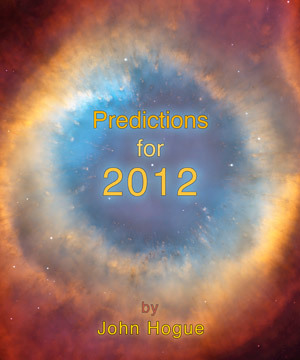 This entry was posted in Meditation and tagged Ashahara, climate change, climate change prophecies, global warming, guru, gurus, Hindu, Hitler, hottest June in history, Isness, Jim Jones, Messiah, Osho, path of trust, predictions for 2010, record breaking temperatures, Sanskrit, trust, tsunami. Bookmark the permalink. Post a comment or leave a trackback: Trackback URL.